Is there anything more frustrating than a lousy handpump? In our short cycling career I must have gone through a dozen pumps, most of which are now landfill. There are two main requirements for a good handpump in my humble opinion: it must fasten securely to the valve stem, and you must be able to apply sufficient pressure when pumping. We have two pumps which meet these criteria: a Topeak Roadmorph, and a Lezyne something-or-other, both of which are pictured below for a side-by-side comparison. The Lezyne is the shiny one. 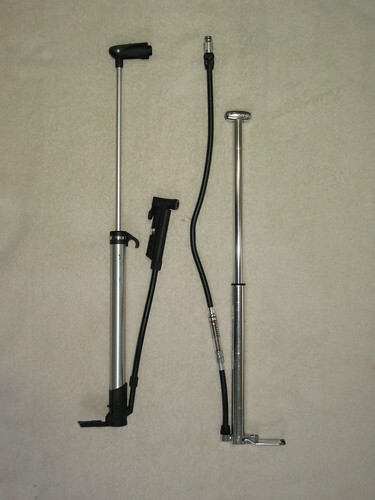 When fully compacted, both pumps are about the same length. The Topeak is slightly longer (with a corresponding increase in stroke length) and slightly slimmer. 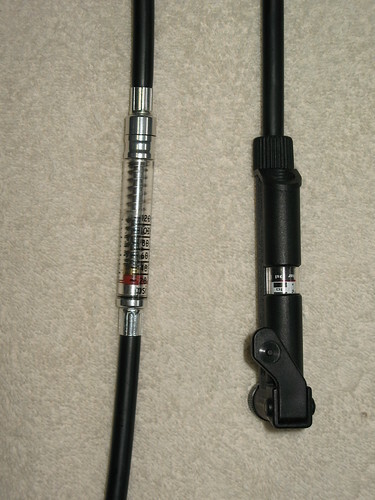 The Lezyne has more girth because its rubber hose is wrapped around the body, whereas the Topeak’s rubber hose has a sliding insertion into the housing of the pressure gauge. In both cases, the rubber hose is a significant plus. 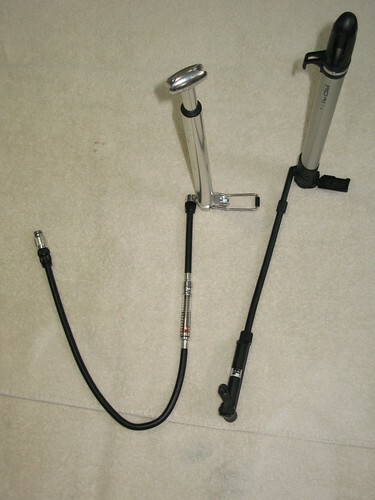 The hose enables you to place the pump on the ground and apply good, hard pressure. Pumps without a hose require you to secure one end of the pump against the valve and then apply pressure with only the strength of your arms. I’m a weakling – it doesn’t work for me. Both pumps have a small lever on which you can brace your foot. In practice these are not very useful unless you have the flexibility of a gymnast. The most significant functional difference between the pumps is the way they secure themselves to the tyre valve. 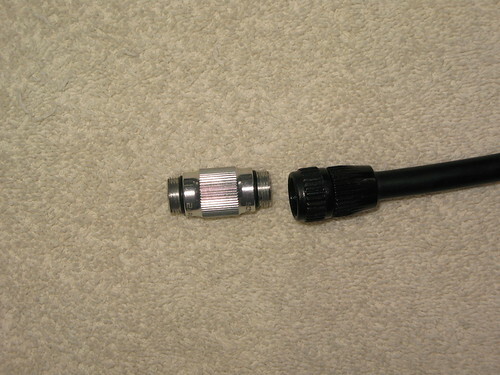 The Topeak uses a cam lever to clasp itself to the valve, whereas the Lezyne is threaded on directly. The Topeak is faster to put in place (if you get it right the first time), but the Lezyne is a more “positive” fit. Also, the valve fitting of the Lezyne (and RoadMorph) is dual-purpose. It can be removed and flipped to either a Schrader or Presta fitting, whereas the Topeak is single-purpose, or so I used to think until Eddie O pointed out that the RoadMorph is also dual-purpose (see Eddie's comment below). This is a big feature for me. When I take the Lezyne or RoadMorph, I know I don’t have to worry whether I have grabbed the right pump for the bike I’m riding. Finally, both pumps have a pressure gauge. The Topeak’s gauge has very tiny numerals and is harder to read for those of us with tired eyes. On the Lezyne you can see the mechanics of the spring mechanism that measures pressure. However, its numerals are stenciled on the outside of the barrel – I don’t know if they will wear off over time. In neither case is the gauge smooth. They adjust to an initial reading on the first stroke, and then stay put for the next 4 or 5 strokes before jumping to a new reading. These are the best two hand pumps I have come across. When touring I like to give the tyres a boost in the morning to about 110 psi, and both pumps perform extremely well. I find the Lezyne slightly more comfortable to use, and the dual-purpose valve fitting is a major positive for me. Besides, its pressure gauge is very cool. Posted by Kern on January 29th, 2012. I find the Lezyne slightly more comfortable to use, and the dual-purpose valve fitting is a major positive for me. Besides, its pressure gauge is very cool. I love Lezyne stuff, they can take the most mundane items and turn them into a thing of beauty that serves its purpose excellently. As soon as I saw their puncture kit I just had to have one – I'm amazed anyone can produce a humble puncture kit that is so attractive! I also have their shiny blue multitool and tiny tyre levers (altho I prefer my Crank Bros Speed Lever). I have a Topeak frame fitting pump which serves its purpose but I'm a convert to CO2 inflators – watching my tyre inflate rock hard in a fraction of a second always puts a smile on my face! The best mini pump in the Bailey household belongs to Mrs Bailey. Like everything else on her bike it a Giant model (er, I think), with a fold-out handle. I have two mini pumps. They are the same model, but I have no idea what they are. I gave up on my socket and toolset last summer and let my Dad buy me a multitool for my birthday. It was a Lezyne model with a chain splitter I hope never to use. My latest mini pump is a Topeak Race Rocket MasterBlaster. The only time I've used it during the past year is when I tried to assist a couple of Aussies with a puncture and no pump and we couldn't get the tube thingy to screw on the valve. It is one of the lightest available, I do know that. I assume it can be made to work but tend to stick to the track pump. When we've toured for a couple of weeks (carrying a full length Blackburn pump) we've never touched the tyres. A good round-up Kern. Your Lezyne is a Micro Floor Drive HV I think. If (when) I buy another I'll try one. It looks the business (although vaguely medical in styling). One criterion I might add is ease of cleaning, as mine get filthy. Some cyclists seem to like CO2 inflators but I remember a discussion somewhere as to whether the tyres remain inflated for as long as with normal air. I don't know much about them except that they seem 'all or nothing' (I might be wrong). Thanks very much, Eddie O, for pointing out the dual-nature of the RoadMorph. I had not realized that they are adaptable and just morphed one of my RoadMorphs based on your video instruction. Very handy and helpful. I also did a fast content edit above so I don't mislead people. I have the Topeak pump that you featured in this review Kern. 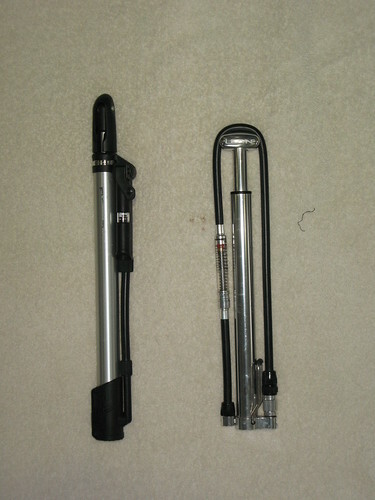 As a namby pamby female, I have struggled with some cycle pumps, but I get on really well with the Topeak one. I have not found a suitable clamp to attach it to my bicycle frame without leaving scratch marks, even on my titanium frame on my Enigma winter bike. But as luck has it, it fits nicely in a sideways direction in my Carradice rear saddle bags. I got a puncture while on my LEJOG while I was alone, the Topeak got my tyres up good and hard ready for the road. I think its a great pump for the money, and I have had it some time now. Purchased from SJS cycles. I can get my tyres up to about 95-100 PSI which for me, is plenty of puff enough. Thanks for the comparison. A comparison of strokes to reach a certain pressure, for same size tire, was what I was looking for. I have the Lezyne pictured. It takes me 200 strokes to get to 80 PSI in a 700c X 28mm tire. The screw-on valve is great. But any pump that attaches to the frame at the center of the pump will invariably flex and rattle. Attaching a pump like old frame pumps is more secure (each end braced against the frame). Lezyne marketing chooses to make a confusing array of pumps with only slight variations, each with a clever name that does not help a buyer decide. For mounting at water bottle bolts, Lezyne metal mounting yokes and plastic ones, with slightly different diameters (not interchangable). The plastic ones are flexible, so expect more movement. Strapping the pump sideways across a bag works okay. Tip: to save palm of hand, put a padded glove over the handle.